A fully automated double beam system with Fast Sequential operation for improved productivity. Enhanced capabilities, including full PC control and automated operation as standard. The SpectrAA 220 optics feature four lamp positions with automated wavelength and slit selection, and high intensity deuterium background correction as standard. Lamps are mounted in fixed positions, and a rotating mirror is used to select the operating lamp, eliminating the need for a conventional turret. For maximum stability in an automated sequence, a software controlled next-lamp warm up facility is provided. Conventional AA systems still determine one element at a time, repeating all samples for each element in turn. SpectrAA-220 FS provides complete results for each sample in minutes. Includes computer #31940 with Varian AA software version v3.10 installed. See attached brochure for more details. 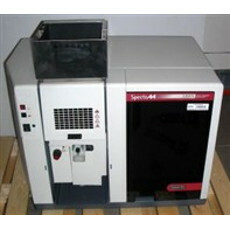 Find the Varian SpectrAA 220FS you need and shop from a wide selection of vendors. Buy now or request a price quote.